"Grandmas are wise beyond their years and often give us memories to cherish for the rest of our lives. 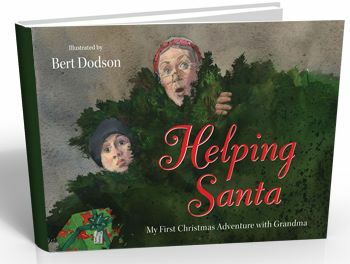 Helping Santa: My First Christmas Adventure With Grandma is the story of one of those enchanting moments. Told there is no Santa by his older sister, the narrator recalls rushing off to consult with his Grandma who, he was sure, “would be straight with him.” After roundly and immediately declaring the idea that Santa might not exist to be wholly and absolutely “ridiculous”, she challenges him to become one of Santa’s helpers, and suggests he buy and deliver a gift to someone who really needs it. Thus he learns, as the adventure unfolds, the true meaning of Christmas and what Santa Claus is really all about. This popular and for many now a traditional Christmas story exists on the internet and has no author that can be traced to date. However, not knowing who first told this tale does not lessen the message, which fully encompasses the spirit of Christmas and reassures us that we never have to stop believing in Santa Claus. In the spirit of this belief, we have chosen to contribute to a nationwide organization whose mission is that everyone who needs a warm coat can get one in his or her hometown, easily, free of charge. We will be giving a percentage of the monies earned from the sale of this book to One Warm Coat"
The second is "The Red Suit Diaries" by Ed Butchart. "Tom Brokaw said it best about the author: This Santa "can only be described as the real thing." With warmth, humor, and wonder, Ed Butchart shares his stories as a professional Santa Claus in The Red Suit Diaries. Deftly combining his Santa persona with his passion for God, Butchart reveals himself as a once-hardened Marine who found Jesus and began to serve others in unusual ways. Readers who open The Red Suit Diaries will find themselves transfixed-from Santa's day job refurbishing medical equipment for the disabled, to the sweetest of secrets whispered in Santa's ear and written in letters, and the story of how he unknowingly found "Mrs. Claus." Woven throughout is a faith-and a joy of giving-that energizes Butchart's mission to spread love to all kinds of children and adults. This fun-spirited, inspirational read will delight collectors of Christmas books and anyone who's a child at heart." Hi, my name is Jocelyn, and I am a Christmas book addict. just tell me you now own that lovely piece at the top of your blog.....the cut out whatever. Amazing! Yay! One of my favorite Christmas stories is called the Littlest Shepherd. We read it every year! Ohhh, I like the sound of that Grandma one!